Ask fellow campers about "Cherry Hill Mobile Home Park" and nearby attractions. Rate reflects monthly with electric included. We have been full timers for 4.5 years and this is the 4th time we have stayed at this park and we have never had a problem. At all other parks people have left our stuff alone but yesterday we had one of our bikes stolen so if you use this park make sure everything is locked and bikes are chained. This park is a old mobile home park with huge lots and a lot of trees and the people are friendly. Getting off the interstate and back on is a little tricky. I will use this park again but will not be so trusting. We camped at Cherry Hill Mobile Home Park in a Motorhome. We stayed here for 30 days. The monthly rate was almost the same as we paid in OKC. We didn't have cable here and the wifi was not great. It didn't even work the first week and when it did come back on line we found we were limited to one device at a time and the speed was pretty bad. They only mowed the grass once while we were here and the mosquitos were so bad we couldn't even sit outside in the evening. When we reserved the site we were told it was a pull-through, but it was not. If you are unsteady on your feet, you have to be very careful as there seems to be a mole infestation and there are piles of dirt and soft spots everywhere. There is a sewage treatment facility nearby, so if the mosquitoes didn't keep you indoors, the smell would. This isn't a fault of the park, but definitely worth noting. We camped at Cherry Hill Mobile Home Park in a Fifth Wheel. Downtown Tulsa is a great place to go with lots of new and interesting restaurants. Also, definitely check out the newly opened Gathering Place. It is the 2nd largest park in the US, after Central Park in NYC. This is a mobile home park (some trailers kept up and some not so much) with some RV spots. However, we found the park to be quiet with spacious sites and paved streets. Our site was a very spacious pull-thru with shade trees, which really helped in the 95 degree weather. The park is across the street from a nice bike trail - 4 miles to DT. 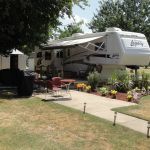 We camped at Cherry Hill Mobile Home Park in a Motorhome. The bike trail along Riverside Drive (on the east side of the Arkansas River) is really nice. The Gathering Place (huge park) just opened and is awesome! And the Philbrook Museum of Art has spectacular gardens! Stayed here four nights for conference in tulsa. Overall the place is dirty and unkempt. Worry about safety. Pool area appears the only clean place Campsites are a mess, hard to tell working from broken hookups. The entire place needs a good cleaning. No wi-fi at sites. 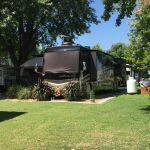 We camped at Cherry Hill Mobile Home Park in a Fifth Wheel. Tulsa very nearby the only thing I was interested in. Ok park. Stayed here to be near friends. It is mainly a mobile home park. The manager was very nice. No cable but over the air channels were fine. We camped at Cherry Hill Mobile Home Park in a Fifth Wheel. There is shopping, museums and plenty of restaurants. The site was long, but narrow, not slide outs touching, but close enough that you wanted to keep your shades down. There was gravel for the RV, a concrete pad for the truck and another concrete pad as a patio. There was no picnic table or fire ring. Train goes through the center of the park but I only remember hearing it a couple of times during our week long stay. There was some road noise, not enough to justify ear plugs with the windows open. It is across the street from a water treatment facility; the stank was only noticeable when walking on the bike path. There are three different directions you can go on the bike path right from here. Full hook ups were conveniently located. Wifi is only in certain locations like the office. Noticed cars in the lot by the office one night; someone mentioned it was bingo night. I guess transients are not notified. Lots of bits of trash everywhere and our site had over a foot high grass. There were folks mowing and raking, but not keeping up with whole place. There were large lush trees, birds, squirrels, and rabbits. Not great, but not bad either. We camped at Cherry Hill Mobile Home Park in a Fifth Wheel. We have stayed here many times over the past few years. Once for a month. The park is an old mobile home community with a fair number of old time residents. Park is convenient to the Arkansas River trail for hiking or biking. Really nice trails. The one big negative to the park is the trash from the residents kids. Seems they do not teach the kids to pick up trash. Also a few rather ratty looking and trashy mobile homes. The manager needs to institute a fine for sites that are trashy and enforce the fines. We camped at Cherry Hill Mobile Home Park in a Fifth Wheel. Ride bikes along the Arkansas River trail. We were quite disappointed in this park. We had read all the reviews and looked at the web site pictures but neither matched our experience at Cherry Hill. Positives: It was the closest park to the hotel where a convention we were attending was held. The lady in the office was very nice. The pool looked clean, though we didn't use it. It is close to I-44 but not terribly noisy. Not-so-positive: The showers and restrooms were closed for repairs during our entire stay. Most of the mobile homes and trailers we saw looked shabby (the mobile next to us had venetian blinds with lots of broken slats and was run-down). The grass on and around our site looked like it hadn't been cut in a month. Our "gravel site" was more grass than gravel. We had expected a pull-thru but were told they only had 3 and those were reserved for over-nighters (we stayed a week). We were in full sun, though past reviews praised the trees. We camped at Cherry Hill Mobile Home Park in a Motorhome. We had tried to get into another area campground, but they couldn't take our 60' motorhome and car. After staying at Cherry Hill, I can understand why they would be too full. We would definitely try to stay there the next time we are in the area, but it sounded like they are often full. They recommended Cherry Hill. Did not use the pool, but it looked very clean and well kept. The bathrooms and laundry were under construction and being updated so were closed on this visit. As others have stated, the pull through sites for rv's can be extremely long, mine was 150ft and was level and clean. The trees gave leanty of shade but still would let a satelite dish get signals. The back in sites were at least 60 ft long and you might be next to a mobile home site. Almost all were well kept and the park seems to be run with a rule to keep it clean. If your in the area this would be a nice location to use as your "home base" for exploring Tulsa. We camped at Cherry Hill Mobile Home Park in a Motorhome. This is a different type of RV park. I believe that it was once a mobile home park but now has become an RV park. There are still some mobile homes but the majority of the park is RVs that are here permanently. Because it was a mobile home park the sites are large, grassy and have concrete patios. It is well kept and extremely quiet. The transient sites that they have are very long pull-throughs (ours was 150 ft). There are lots of trees (even nesting eagles) but the site was satellite friendly. The people are very nice and extremely helpful. The location is great. It is within walking distance to the bike trail on the Arkansas River and only 5 miles from downtown Tulsa. Utilities were all good and streets are wide. We enjoyed our stay at this park and will return again. We camped at Cherry Hill Mobile Home Park in a Motorhome. Had a level grassy site backing up to the railroad track. One train went through during the afternoon so we were not disturbed by noise. Quiet and clean. Friendly staff. Good Verizon and Direct TV coverage, but had to move the satellite around to avoid trees. Will stay there again. Easy access off interstate. We camped at Cherry Hill Mobile Home Park in a Motorhome. We chose to stay at this park given the Good Sam rating and pictures on the website. We're really not sure which sites were the models but it wasn't ours. This is an older mobile home park with spaces for RVs. I kept telling myself this is a family oriented park and I shouldn't be concerned about security. My husband was somewhat less concerned. The park is located in a more industrial area. There must be some sort of treatment plant nearby because the odor the night we stayed was rank. The site was clean and all spaces were free of trash or mess. It is very convenient to the highway but other conveniences like restaurants and shopping were challenging to find. We stayed one night. We camped at Cherry Hill Mobile Home Park in a Travel Trailer. Stayed in a 40' 5th Wheel. Staff was very helpful in finding a pull thru slot. We have stayed here often and have had to back in, but those spaces are generally easy to get into. Grounds are clean and kept mowed. Very near the bicycle trail system along the river. This is our go to camp when we come to Tulsa to visit. We have stayed here 17 nights in the past three years. We camped at Cherry Hill Mobile Home Park in a Fifth Wheel. It was very cold, so we did not take advantage of many of the amenities, but it was a good experience overall. The staff was friendly and helpful. They had a nice pull-through spot for us that was level. The showers were clean and hot - just what we needed! We camped at Cherry Hill Mobile Home Park in a Motorhome. Tulsa is a great city lots of things to do and places to eat!!! Are you affiliated with Cherry Hill Mobile Home Park ?